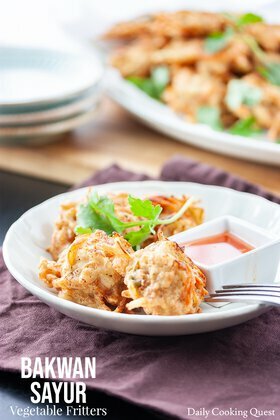 Asinan is an Indonesian dish where a combination of fruits and vegetables are cut and dice into small pieces and doused in a sweet, sour, and savory pickling liquid. Though I say pickle, there is almost no waiting time for the dish to mature other than chilling the whole thing in the fridge for a couple of hours. 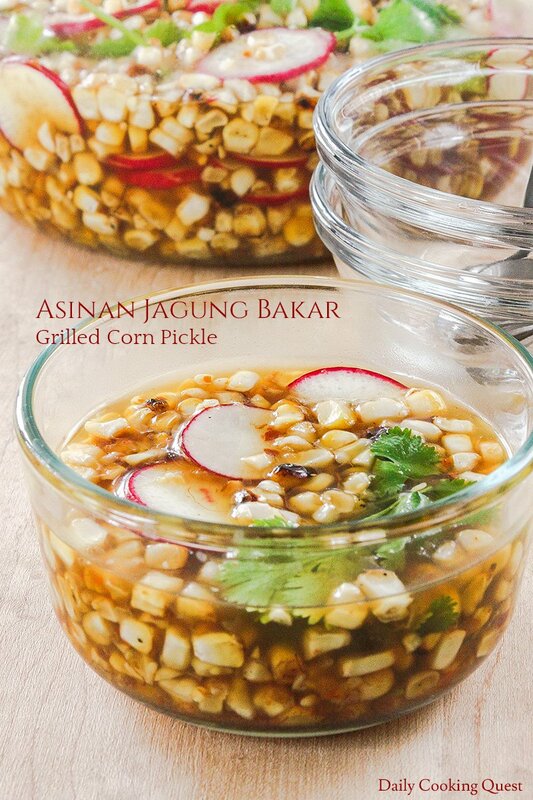 We have quite a bit of asinan dishes, and today I share this super easy recipe for asinan jagung bakar - grilled corn pickle. The main star of the show is actually the pickling juice. The same pickling juice can be paired with other vegetables/fruits depending on what is available in the market, or whatever strike your fancy. Also, since the pickling juice needs to be at room temperature or cooler prior to mixing with the vegetables/fruits, I usually prepare this first. 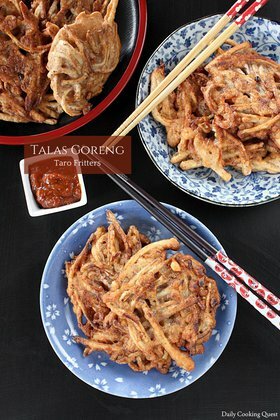 You will need dried red chilies, dried shrimps (Indonesian: ebi), palm sugar, sugar, salt, vinegar, and water. Ground the chilies and shrimps in a food processor, then combine with the rest of the ingredients in a sauce pot and bring to a boil. Let the pickling juice cool while you prepare the vegetables/fruits. 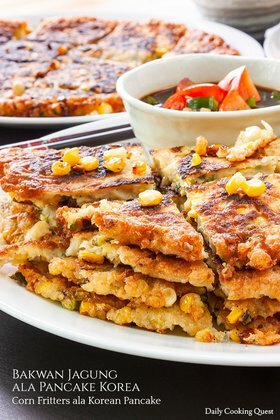 Summer is the time for corn, so I decided to make some grilled corn for this asinan. I grill the corn with butter on stove with a cast iron grill. You can use charcoal grill, or even stick it in the broiler. 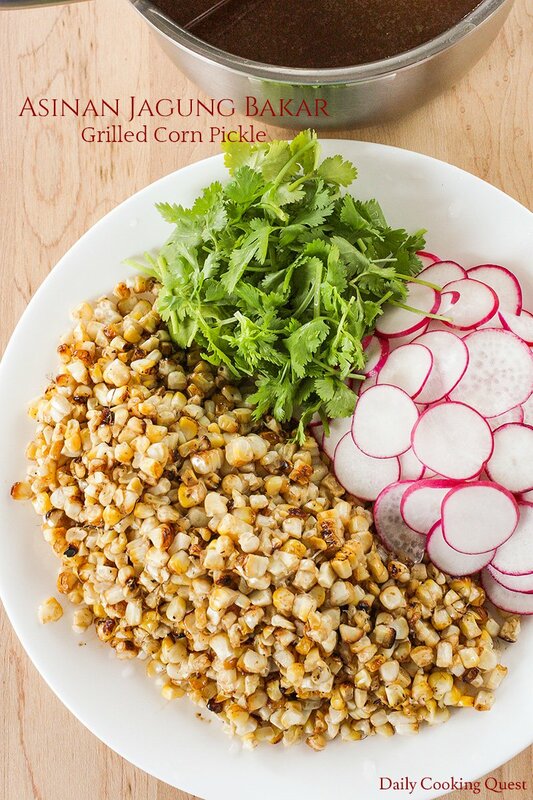 Once you have some grilled corns, cut the kernels off when cool enough to handle. I also use radish and cilantro, but these are served raw, so you only need to slice the radish and roughly chop the cilantro. Once the pickling juice is cool enough, at least at room temperature, you can start making the asinan. Place all the vegetables/fruits in a large mixing bowl, and pour the pickling juice to cover by one inch. If there is extra pickling liquid, you can keep adding more vegetables/fruits, just make sure you still have an inch of the pickling liquid over your vegetables/fruits. If the pickling juice is already chilled, you can serve the asinan immediately. Otherwise, it is better if you chill the whole thing some more in the fridge since asinan is best served cold. Ground red chilies and dried shrimp in a food processor. Transfer to a sauce pot along with palm sugar, sugar, salt, and water. Bring to a boil, then simmer for 5 minutes and turn off the heat. Add white vinegar to the pot and stir. Give it a taste test, adjust salt/sugar as needed. Chill the pickling solution. Melt butter in a grilled pan over medium high heat. Add the 4 corns into the hot skillet and grill until thoroughly cooked. 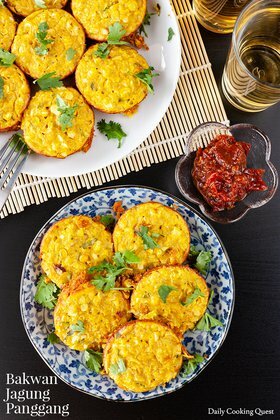 Set the corn aside to cool, and when they are cool enough to handle, cut off the kernels. 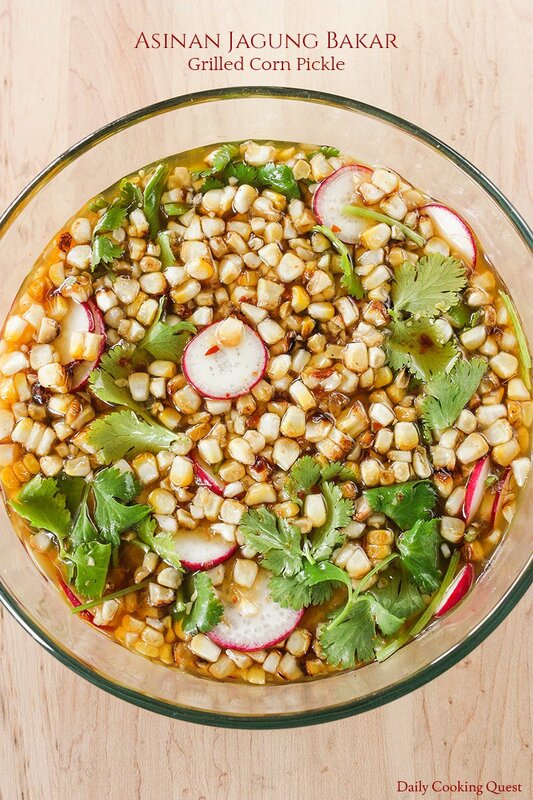 Place corn kernels, sliced radish, and chopped cilantro in a mixing bowl. Pour the chilled pickling solution. There should be enough solution to top the vegetables/fruits mixture by an inch. If you have extra pickling juice, feel free to add more vegetables/fruits. Serve chilled.